“The market continues to evolve and new approaches have emerged that more efficiently store and process data." Data here, data there, and by 2019, data will be everywhere. So much so that the Total Data Market, consisting of data platforms, data management and analytics, will nearly double in size between 2014 and 2019, reaching new heights of $US115 billion. 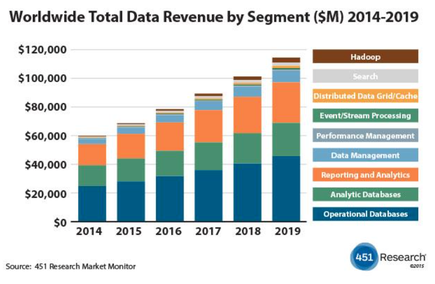 In announcing significant revenue growth for the present $US60 billion Total Data Market, 451 Research predicts the focus on ‘big data,’ which has driven a wave of adoption to address unstructured data in addition to existing structured data processing and analytics technologies, will lead to a market CAGR of 14 per cent from 2014 to 2019. The specific market segments included in 451 Research’s analysis are Operational Databases, Analytic Databases, Reporting and Analytics, Data Management, Performance Management, Event/Stream Processing, Distributed Data Grid/Cache, Hadoop and Search-Based Data Platforms and Analytics. The forecast is based on 451 Research’s new Total Data Market Monitor service, which presents data, generated via a bottom-up analysis, of 202 vendors that participate across the nine Total Data segments the company tracks. Specifically, 451 Research tracks 56 Operational Database participants, 26 in the Analytic Database market, 72 within the Reporting and Analytics segment, 41 Data Management vendors, 11 Performance Management vendors, 11 Event/Stream Processing vendors, 9 Distributed Data Grid/Cache vendors, 25 Hadoop vendors and 15 Search vendors. “The market continues to evolve and new approaches have emerged that more efficiently store and process data, while also providing access to those that need it to analyse it and gain business insight,” says Matt Aslett, Research Director, 451 Research’s Data Platforms & Analytics Channel. Aslett says the 56 Operational Database vendors generate the bulk of total market revenue, followed by Reporting and Analytics and Analytic Databases. Rounding out the $US1 billon plus market segment group is Data Management with the remaining segments all below the $US1 billion mark. In addition to the top-line market and sub-sector revenue, 451 Research segments market revenue into geographic regions, by Total Data- as-a-Service and segment Operational Databases into NoSQL, NewSQ and Traditional Relational and Non-relational Databases.